If you’ve just received your new Instant Pot Ultra multi cooker, but don’t know what to do next, this beginner’s guide to using the Instant Pot Ultra is going to help you get started. It gives you instructions on the various parts of the Instant Pot Ultra and also gives directions on how to complete the Water Test (Initial Test Run). I’ve owned my Instant Pot Duo 6-Quart multi cooker for about a year. Before that, I used a stove-top pressure cooker for many years. Growing up in an Indian household, the sound of the pressure cooker in the kitchen, with its hissing and steaming and loud noises, was a regular part of my day. When my children were little , I would have to warn them when I was getting ready to use the pressure cooker and they would run out of the kitchen! Well, times have changed. The Instant Pot ain’t your momma’s pressure cooker. It’s safe, easy, quiet, and can be left alone unattended. What a change that was for me! Even though I’ve loved my Instant Pot Duo, I was very intrigued by the new Instant Pot Ultra 10-in-1 multi-cooker. I was like a gadget geek waiting for the next smartphone. Well, the Instant Pot Ultra definitely lives up to its name and I love it. Since I was already using an Instant Pot Duo (6 quart), I’ve found the transition to the Instant Pot Ultra 6 quart very easy. But if this were my first Instant Pot, I can see how it would be pretty overwhelming, with even more functions and features than the Instant Pot Duo. Soon after I got my Instant Pot Duo last year, I wrote an Instant Pot Duo Beginner’s Quick Start Manual which gives detailed directions on how to use the Instant Pot. I love getting comments and emails from people who find it helpful, especially because of its step-by-step instructions and photos. So I wanted to do that same type of instruction manual for the Instant Pot Ultra. If you’ve just received your Instant Pot Ultra, and don’t know what to do next, you’ve come to the right place. I’m going to give you directions on how to use the Ultra for the first time. This instruction guide assumes you have no prior experience with the Instant Pot. We’ll go over the parts, important features, how to assemble the Instant Pot Ultra and we’ll do the initial test run (what used to be called the ‘Water Test’). Instant Pot Ultra allows you to adjust the cooking settings while cooking is in progress. I’ll give you enough directions to get you started and become comfortable making your first recipe in the Instant Pot Ultra 10-in-1. 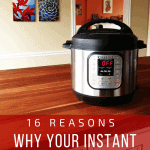 You can read about all the features of the different models of Instant Pots at this guide I put together on which Instant Pot to buy. 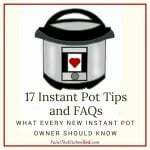 If you need even more information, please visit the Instant Pot website. Note: If you’re looking for Instant Pot Ultra recipes or Instant Pot Ultra cookbooks, you’ll be happy to know that you don’t need any special Ultra recipes or cookbooks – all Instant Pot recipes can be easily made in the Ultra with no changes. The only difference is how to operate the Ultra (what buttons to press, how to natural release pressure, how to quick release pressure, etc), which you’re going to learn here. At the bottom of this article is a chart showing you some differences between the Ultra and the Duo models. First Step: Unbox the Instant Pot Ultra 10-in-1! I know that many people order the Instant Pot, and then let it sit around for months because they feel intimidated using it. If you’ve been reluctant to take the Instant Pot Ultra out of its box, know that you’re not alone. But don’t wait another minute! Open the box and remove the Instant Pot and its parts. We’re going to do this together, it’ll be a breeze! The Steam Release Valve is a safety mechanism that allows steam to escape and maintains the correct pressure level. It sits loosely on the lid and can be removed to be cleaned. 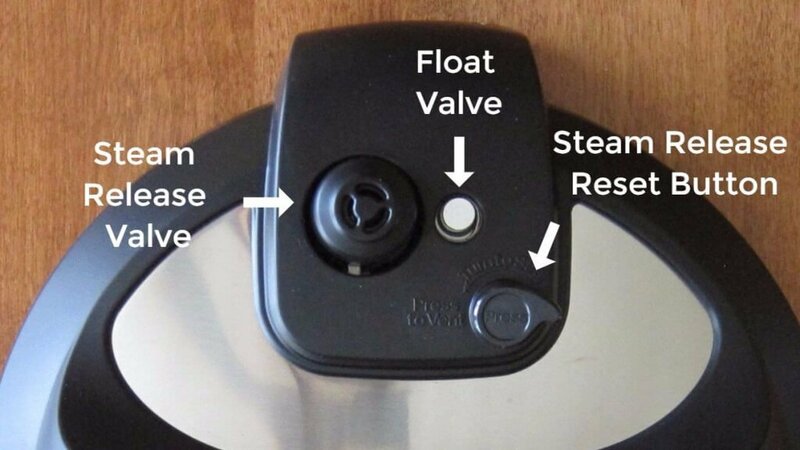 The Float Valve is a safety feature that pops up when the Instant Pot reaches pressure and engages the lid’s locking mechanism so the Instant Pot cannot be opened. 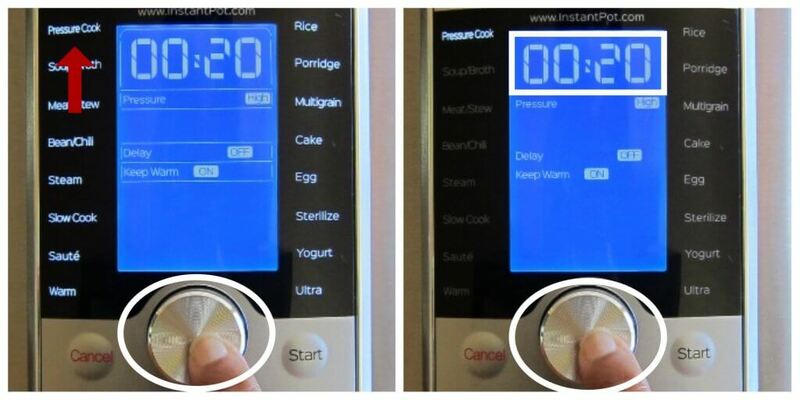 The Steam Release (Reset) Button (also referred to as Pressure Release Button) allows you to manually release pressure from the Instant Pot Ultra. Press down to manually release pressure, and turn counter-clockwise to stop pressure release. 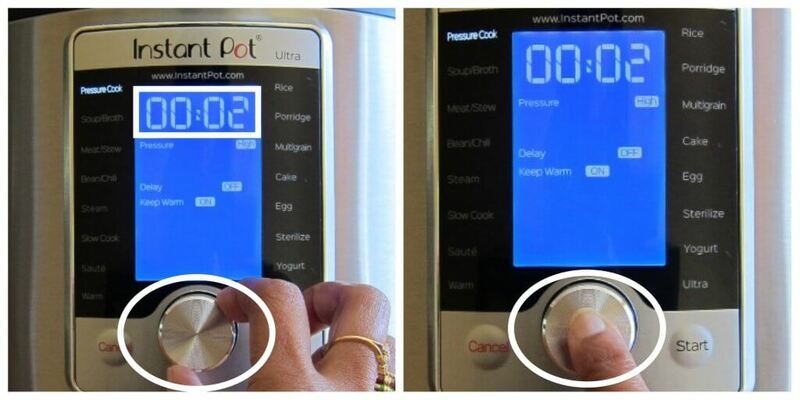 The Steam Release Reset Button automatically pops up when the Instant Pot Ultra lid is opened or closed. The Sealing Ring is made out of silicone and it tightly seals the lid, and it prevents steam from escaping from the Instant Pot Ultra during cooking, which allows it to reach pressure. The sealing ring can retain odors, so I recommend that you buy a second sealing ring if you’re going to be making desserts in the Instant Pot Ultra. The Float Valve (as described above in the ‘exterior’ section) is a safety feature that pops up when the Instant Pot Ultra reaches pressure. It engages the lid’s locking mechanism so the Instant Pot can’t be opened. The Anti-Block Shield prevents food particles from interfering with the Steam Release Valve, especially when cooking foamy foods like pasta or grains. Pull up on the Sealing Ring and gently pry it out of sealing ring rack. Don’t pull on it with too much force, or it can be stretched. Return it back to the sealing ring rack. Push it back in, a little at a time until it’s securely seated in the sealing ring rack. You’ll know it’s seated properly if you can turn/rotate it in the sealing ring rack, with a bit of effort. If you don’t put it back in correctly, the Instant Pot won’t seal and your food won’t cook. Pull up on the silicone cover of the Float Valve. Both parts of the Float Valve (metal part and silicone cover) can be removed. Re-insert the metal part of the Float Valve back into the slot from the outside of the lid. While holding the metal part in place, replace the silicone cover on the inside of the lid. Removing the cover of the Anti-Block Shield can be tricky. 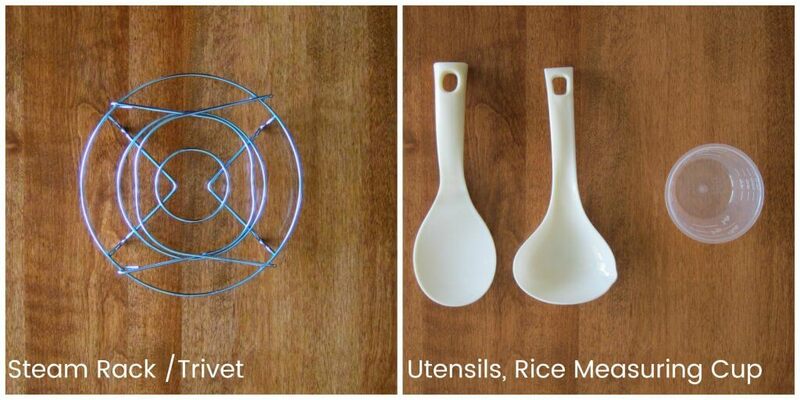 Using a silicone/rubber trivet or jar opener makes it much easier. Push against the Anti-Block Shield in an upward motion. To replace, push the cover back on. Place the stainless steel inner pot into the base unit. Slide the condensation collector into the back of the Instant Pot Ultra. It will sit snugly against the base unit. Although it doesn’t fill up very often, it will collect the condensation that drips down from the lid, if you prop the lid open. To clean it: slide it out, empty, rinse and slide back in place. Insert the power cord into the back of the Instant Pot and plug the power cord into an electrical outlet. The display will turn on. 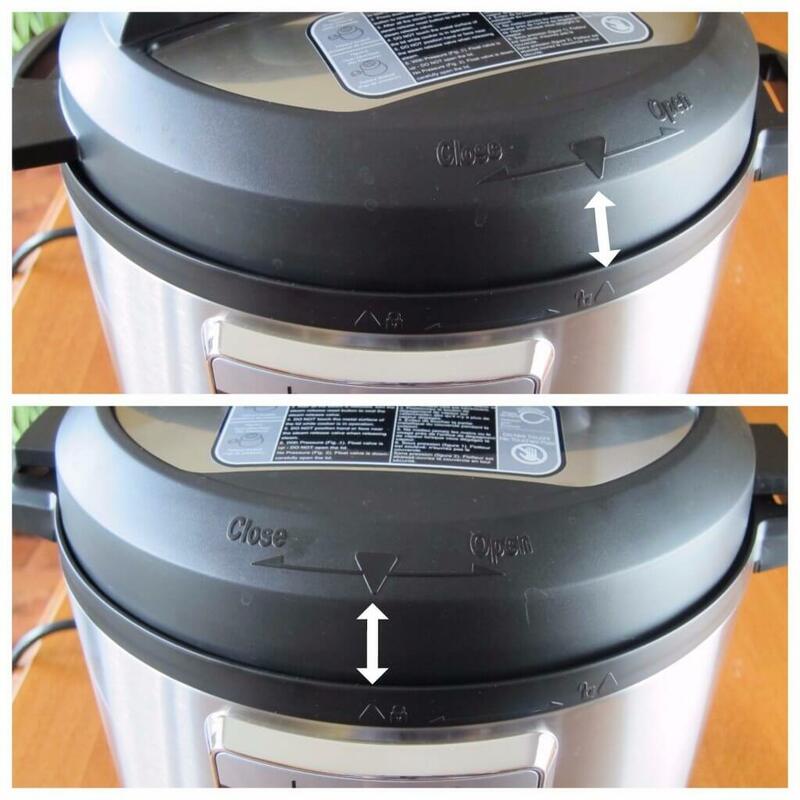 To close the lid, place the lid on the Instant Pot base unit and line up the arrow on the lid with the “Open” (image of an open lock with an arrow) on the base unit. Turn the lid clockwise until the lid arrow lines up with the “Close” (an image of a closed lock with an arrow) on the base. You’ll hear a chime (if the Instant Pot Ultra is plugged in). To open the lid, turn the lid counter-clockwise until the lid arrow lines up with the “Open” (an image of an open lock with an arrow) on the base. 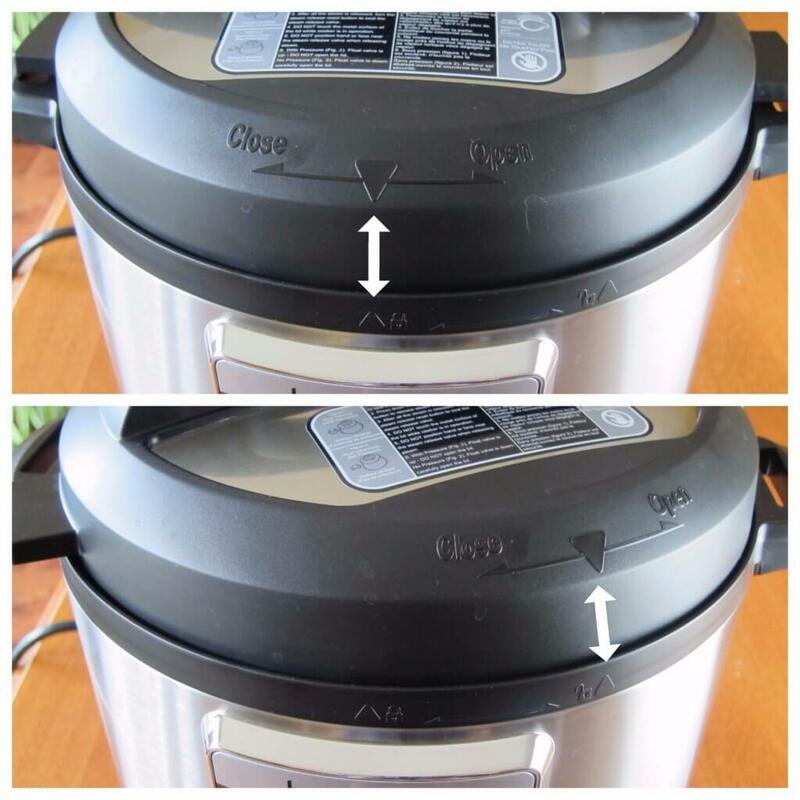 To prop open the lid, insert the Lid Fin into the notch in the handle of the Instant Pot Ultra. When the Instant Pot Ultra is under pressure, the Float Valve goes up and the Instant Pot is sealed. It cannot be opened. Don’t try to force it open! When the Instant Pot Ultra isn’t under pressure, the Float Valve goes back down, and is level with the lid. There are two ways you can release pressure once the Instant Pot Ultra has finished pressure cooking. The recipe you’re following will tell you what method to use. 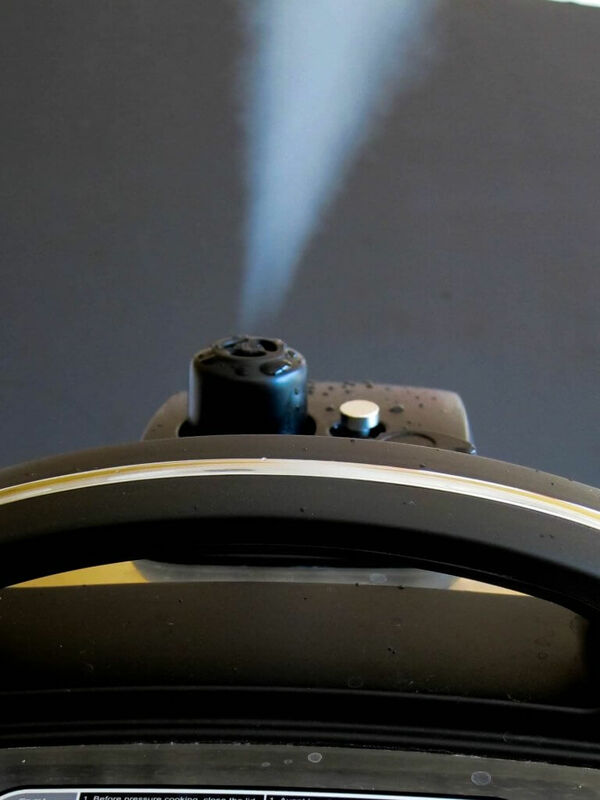 To do a Quick Release of pressure (QR), press down on the Steam Release Button until it locks into place, and steam begins to come out of the Steam Release Valve. Be sure your hand is not above the Steam Release Valve while the pressure is being released. The Float Valve will go from the up position to the down position once the Instant Pot Ultra has de-pressurized and all the steam has been released. It is now safe to open the Instant Pot Ultra. To do an Instant Pot Natural Release of Pressure (NPR), wait for the Float Valve to go down on its own. This can take anywhere from 5 minutes to 30 minutes, depending on how much liquid is in the Instant Pot. The more liquid you have, the longer it takes for the Instant Pot to release pressure on it’s own. If you’re in a hurry, you can wait for 15 minutes for the Instant Pot natural release, and then release the remaining pressure using the quick release method. Attach the power cord to the Instant Pot Ultra , and plug it into an outlet. Pour 1 cup water into inner pot. You can add more water, but your Instant Pot will just take longer to come to pressure. If the display is off, press the knob/dial to turn on the display. The ‘Pressure Cook’ option will be blinking. Press the dial to select the ‘Pressure Cook’ option. The cooking time (in my case it’s 00:20 i.e. 20 minutes; your display may have a different time) will have a box around it that’s blinking. Press the dial to select the cooking time. Now, the time will be blinking. Turn the dial until the time changes to 00:02 (2 minutes). Press the dial to confirm the time. We’ll keep the default settings for Pressure level (High), Delay Start (Off), and Keep Warm mode (On). Press Start to begin the pressure cooking. The Instant Pot Float Valve will go from the down position to the up position once the Instant Pot has sealed. This can take up to 10 minutes for 1 cup of liquid. There will be some hissing and steaming, and all sorts of noises coming from the Pressure Release Valve and the Float Valve while the Instant Pot is coming to pressure. There is nothing to worry about! You might also notice a plastic-like odor. This can happen during first use, and shouldn’t happen again. 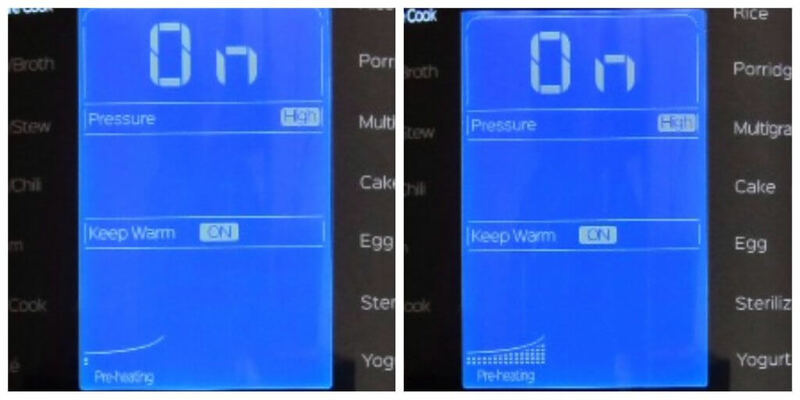 The display with change to ‘On’ and will remain ‘On’ until the Instant Pot reaches pressure. Notice that the graph on the bottom of the display will show that the pre-heating is complete. The Display will change from ‘On’ to 2 minutes (00:02) and will count down from 00:02 to 00 00. Notice that the graph on the bottom tells you the cooking progress. 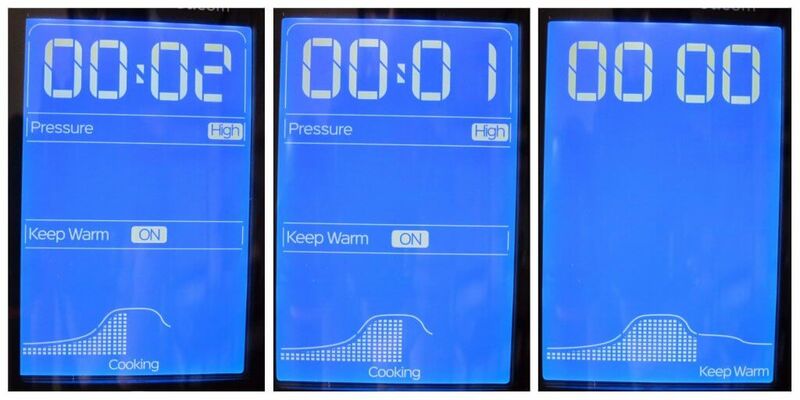 Once the Instant Pot Ultra is in ‘Keep Warm’ mode (as seen on bottom right of the display), it will begin to count UP from 00 00. Do a Quick Release of pressure (QR) as detailed above in the How to Quick Release section. Or wait till the pressure releases on its on as detailed above in the How to Natural Release (NR)/ Natural Pressure Release (NPR) section. Initial Test Run is now complete! Now that you’ve completed the initial test run / water test, you’re ready to cook your first dish. I suggest either Instant Pot Rice or Instant Pot Hard Boiled Eggs for your first attempt. But all my recipes are written with beginners in mind and have step-by-step instructions and photographs. I also strongly recommend that you follow the recipe exactly the first few times – don’t substitute ingredients and change quantities. Once you’re more comfortable with cooking in your Instant Pot Ultra, you can modify the recipes to suit your needs. If you’re looking for Instant Pot Ultra recipes, my newer recipes are written with step by step photos of the Ultra, especially useful for new users e.g. Instant Pot (e.g. Instant Pot Korean Beef). Even if you don’t want to make the recipe, looking at the step-by-step photos and instructions might help you in making another recipe. If the recipe you’re looking at was written for the Instant Pot Duo (e.g. Instant Pot Chili), you can translate it for your Instant Pot Ultra pretty easily. There are separate buttons for each cooking function. Use the ‘Manual’ mode/button to pressure cook. Use the knob/dial to toggle between functions and to select options. Select the ‘Pressure Cook’ function to pressure cook instead of using a ‘Manual’ mode. The Steam Release Handle moves between the ‘Sealing’ and ‘Venting’ positions. 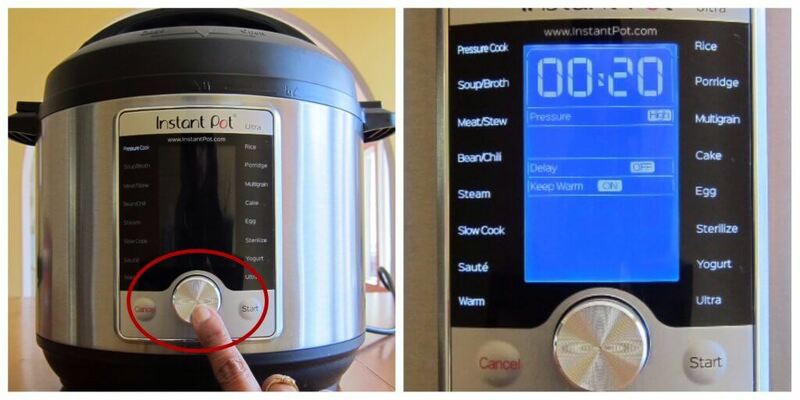 The Steam Release Handle has to be manually moved to the ‘Sealing’ position when the Instant Pot is closed. The Steam Release Button is pushed down to lock into venting mode and turned counter-clockwise to seal again. 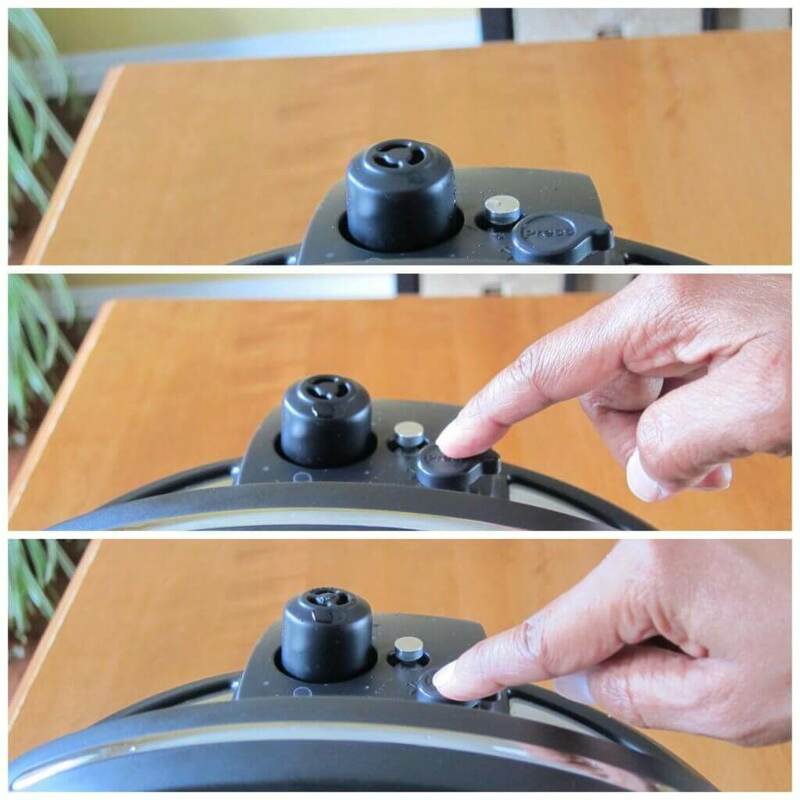 The Steam Release Button automatically resets to the ‘Sealing’ position when the lid is opened or closed. 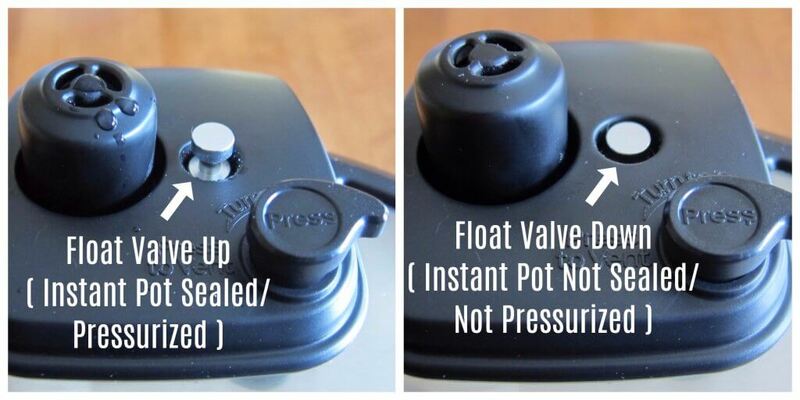 The Float valve is at level of lid when the Instant Pot Duo is sealed and below the level of the lid when it’s not sealed. 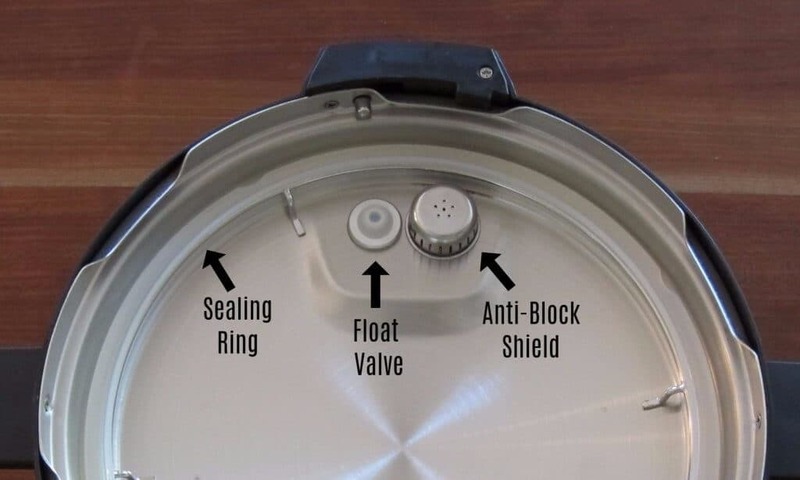 The Float valve is above level of lid when the Instant Pot Ultra is sealed and at the level of the lid when it’s not sealed. 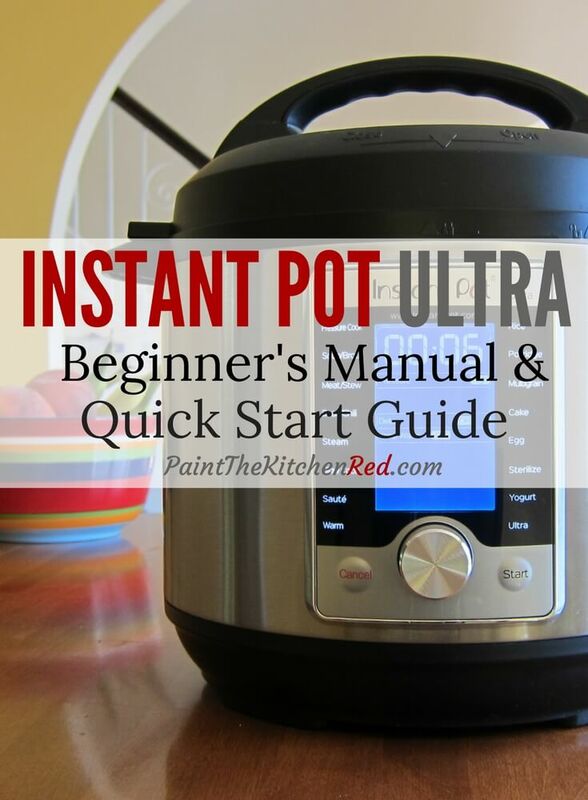 Disclosure: My thanks to the Instant Pot Company for sending me an Instant Pot Ultra 60 for the purposes of creating this instruction manual / quick start guide. All opinions are my own, and the Instant Pot company had no input into this post. If this article was helpful to you, please share it on social media using the social media share buttons at the top and bottom of this post. Thank you so much! Thanks Connie! 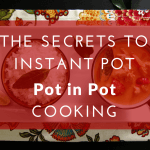 I know how hard it is for some people to get going with the Instant Pot – hopefully this is will encourage them to try it out. Hi! I am SO interested in the Sous Vide function on my IP Ultra, and I can’t find anything to help me out! What do you know? Can you direct me to the right place? Thank you so much! Christy – you might want to check out reddit. There’s also an IP Ultra facebook group that might be of help to you. Thanks for great instructions on how to use this machine… this was really helpful! Rochelle – you’re welcome. Enjoy your new Instant Pot Ultra! Cannot thank you enough, exactly what I needed. Hi Cindy – you’re so welcome. Enjoy your new Instant Pot! me, too! I was so lost and helpful people weren’t bec they have the older version – now – off to boil eggs! LOL I too am so happy to find this. Loved the eggs!! Amazing right, how they peel so easily!? I have heard the manual for this is not so good — especially for a newbie. Any thoughts? Hi Brenda, looking at it from the perspective of a newbie, I do think the manual that comes with the Instant Pot is not as clear as it could be. The Ultra manual has improved over the Duo (previous model of IP) manual. If you get an Ultra, my guide will definitely get you started and able to cook your first recipe. There are many features the Ultra has, but you can explore them slowly at your pace. You might not even use most of the features initially. Thank you so much Neena, you are so right my instant pot duo was sitting in the box for a month ? now I think I will able to do water test and then try some recipes. Ritu, You are going to be so glad you did it! Enjoy! Your guide really delivers a rapid start-up for Ultra buyers. The manufacturer’s manual is just not clear. Our frustration was climbing simply trying to figure out how to change the time. Your clear instructions solved that. And my first dish is now cooking. Glad you warned us about the plastic odor in the initial test, too. Thank you! Hi Zorra – yeah, I had that plastic smell with both my IPs, so I think it’s pretty common 🙂 Hope your first dish turned out great! Thanks for your comment. This is very helpful. The manual that came with it was not helpful at all. I struggled to figure out how to set the time and finally did. i was doing the water test to get my feet wet. Am looking forward to cooking with this once I can figure out times for my recipes. Thanks so much. You’re welcome, Gail. Enjoy your new Instant Pot. I suggest making something simple the first time, just to get used to it. Just got an Ultra; no experience with pressure cooking. Found you! You are great! When are you doing a book???? Hi Linda – awww, thanks! I’d love to do a cookbook, but alas not the right time! I hope you enjoy some of my recipes though. Keep in touch. Very helpful! Clear and concise, answered questions and took away the start up fear! Bravo to you and this guide, well done! Debbie – I’m so glad that the guide was helpful and thank you so much for your kind words – they keep me going! This was a great overview. Thank you. I just started using this model last week, and it’s my first time to cook with IP. Question: Is 35 minutes the highest amount of cook time, if I want to set it manually? I select pressure cook, but 35 is the default. I wanted 45 minutes on sometime, and then a natural release. Thanks for answering. Hi Barbara – so glad you found it helpful. No, you can have up to 6 hours of pressure cooking time on the Ultra. The default is usually whatever you last set when you used that function (e.g. meat, pressure cook, egg, etc). To change the time follow the same procedure as in my guide for the water test. Once the rectangle around the time is blinking, press the knob to change the time and then you should be able to turn the knob clockwise to increase the time. Let me know if you have trouble. Just go to the contact page and I will get an email and I can help you out. I wasn’t able to st my time to 8 minutes, only 6 ? And now it’s not counting down.. ? Help ! Hi Kathie – maybe you figured it out, but I think you may have set it for 6 hours and not minutes. 00:08 is 8 minutes. Good luck. Amanda – I have a feeling you probably figured it out? But yes, you can change the cooking time and other settings while cooking is in process. That’s one of the things I love about the Ultra. Thanks for your question. Thanks so much for this incredible presentation. I just unpacked my IPU and you gave me the confidence to prepare my first meal. I have never had a pressure cooker, and was a little scared and a lot intrigued with how they work. I did my water test and gained confidence to keep going, I made a curry lentil soup that was delicious. And it was ready in an hour from idea to dish. Amazing!! Today I will make venison stew. Thanks again for your wonderful work!! I can see giving this pot to friends for Christmas!! You’re so welcome, Pam. Oooh, venison stew sounds wonderful. Enjoy your Instant Pot adventures! How did your venison stew come out? Recipe and time? Ground venison or raw chunks? I’ve already canned venison…can I use it? Thank you so much! I really wish I had found this before starting the initial test run instead of in the middle when I was kinda panicking about the noise and smell. I am a pressure cooker newbie and you explained everything in a simple way. I appreciate it! Now I will attempt to cook my potatoes for Thanksgiving. Wish me luck! Hi Heather – I’m glad you were able to get through it! I just made my recipe for Instant Pot mashed potatoes and parsnips in prep for tomorrow. But I added some cream cheese 🙂 Happy Thanksgiving! Hi Leo – thanks for commenting, that means a lot! Good luck and enjoy your new Ultra – I love mine! Thank you instructions very helpful but will want more information I’m sure. You’re welcome, Sherry. I hope you like your new Ultra – I love mine! All my newer recipes have instructions for Ultra and Duo in the step by step instructions. You are so welcome – thank you for sharing the link, I really appreciate that! You were so right, I bought my Instant Pot and it wasn’t still in the box but became an ornament on my kitchen counter! I finally got the courage to try it and I can’t tell you enough how helpful these instructions were. I have been cooking all my life but have early on-set dementia, it is so hard when you know you know how to do something but it’s just not there in your mind when you need it! These step by step (with pics) instructions have been so helpful I can’t express how much I appreciate your site! Sue, your comment really touched me. Thank you for letting me know – I can’t tell you how much it meant to me. I wish you all the best. After trying to decipher the Instant Pot Ultra instruction book, I might have considered returning my IPU had I not found your EXCELLENTLY WRITTEN manual on the web. The photographs were especially helpful for a newbie like me. Now I’m encouraged to actually USE my Instant Pot for a SPEEDY version of my mother’s “All Day Vegetable Soup Stew”! Oh, that would have been a shame if you’d returned it! Glad to be of help and feel free to ask if you have any questions when you begin to use your Ultra. I think you’re going to love it. Keep in mind that vegetables cook very quickly in the Instant Pot, so I’d suggest you find a similar vegetable stew recipe from a trusted pressure cooker blog or recipe book, and adapt it with your ingredients. Good luck! Thanks so much for writing such clear, concise instructions. The manual that came with the Pot was so vague, and even email correspondence with Instant Pot customer service left me scratching my head. Having never used a pressure cooker before, I was afraid to try it on my own. Now, I’m excited to give it another go. Good luck Judy. I’m sure you’ll do great and you’re going to love your Ultra, like I do. Let me know if there’s any other way I can help you out. What a great article! Is it possible to add how-to turn off the sound and “keep warm” permanently? Thanks Tatiana, the Ultra should ‘remember’ what you set the last time when you used that particular setting (eg. egg, meat, etc) Hope that helps. Thanks!! Just waht I needed to get started. Awaiting receipt of my Boxing Day special IPU. So glad I found your manual! I, too, love kitchen gadgets and I tend to try every feature. I am intrigued by the possibilities this gadget opens up, especially the opportunity to sous vide to a certain extent. Thanks so much for thinking of your fellow users. Thanks for taking the time to comment, Brenda. 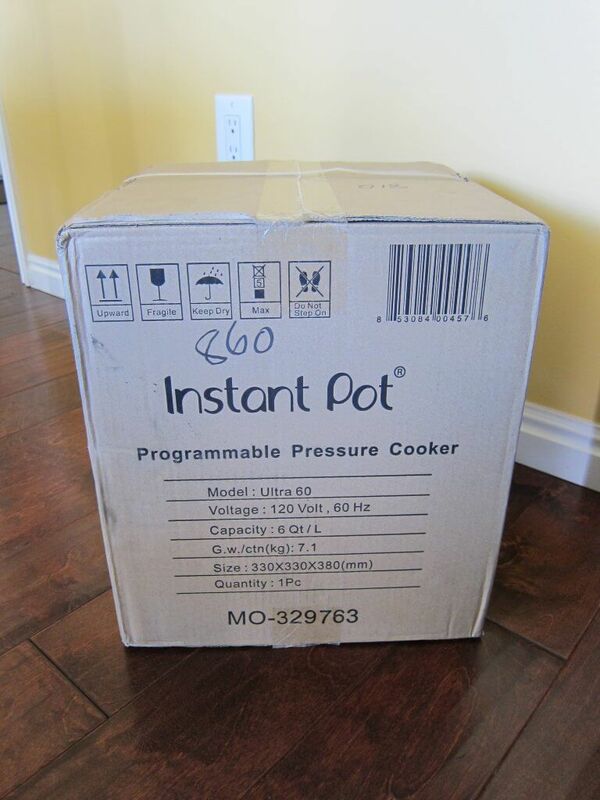 I’m sure you’ll enjoy your new Instant Pot! Let us know how you like the sous vide functionality! You don’t have to preheat when making recipes but you may have read a recipe that calls for it so that the coming-to-pressure part takes less time. I’d need to see the recipe, but it is probably telling you to press ‘Saute’ and let the ingredients heat up before pressure cooking. Don’t be nervous about trying a recipe, but if you look at my recipes, I give step my step instructions and you can use them as a guide. Good luck! I LOVE your site. I just got an Instant Pot for Christmas and like you wrote, I am very intimated by it. I have never used one, so this site is amazing to me Thank you so much for sharing your time to inform us!! Plus it’s a bonus for my family and I because we love Indian food and I am always trying to find the right Indian recipe. ??? Hi Tara – congrats on your new Instant Pot! You’ll probably really like the Instant Pot Chicken Curry recipe – it’s a family recipe. Let me know if you try it out and hope you enjoy your new Instant Pot. You’re welcome Kim – glad you found it useful. Thank you so much for this beginner’s manual! I was terrified of my mother’s pressure cooker when I was a child and that has carried over into my adult years. I think I can use this Instant Pot now without being afraid I’ll blow the house up. I’ve also ordered a couple of cookbooks, so wish me luck! Hi Betsy. When I was young, my mom made a pressure cooker dal (which has turmeric) and the pressure cooker valve blew off and all the curry was splattered on the walls and ceiling! Horrible cleanup job 🙂 Thankfully, there are no such worries with the Instant Pot! Enjoy your new Instant Pot. Remember to start out following tried and true recipes, and start simple the first few times to get the hang of it. Then you’ll be ready to adapt your own recipes! This was enormously helpful. Thank you! You’re so welcome – thanks for commenting and enjoy your new Ultra! My IP has been sitting on my countertop for a week! Your instructions made the process less intimidating, thank you. I was excited to receive the IP as a gift, but soon discovered, there aren’t many pins geared to the Ultra 60 model. Hi Tessa, thank you for taking the time to comment! I received my Ultra a couple months ago and ever since then, my newer recipes give step-by-step photos for the Ultra too. That being said, you can adapt any pressure cooker or Instant Pot recipe for your Ultra. It’s just a matter of pressing/selecting the button for your model. I hope that makes sense! If you want to look at one of my more recent recipes e.g. Instant Indian Chicken Curry Soup, the step by step with photos will give you an idea of what you need to do on your Ultra model. I purchased both the Instant Pot Ultra and the Instant Pot Lux 60 V3. Sad to say, I’m sitting on the fence on which unit to keep. I have high hopes for the Instant Pot Ultra, but often worry that it’s hype doesn’t out weigh the benefits. My goal is to make tasty everyday meals – nothing fancy with a lot of ingredients that I won’t ever use. Hi Frank, I really enjoy my Ultra, but I use it almost every day. I also have a DUO, but like the interface of the Ultra a little better. If you just want to make basic meals and don’t need to ever cook seafood or vegetables at low pressure or make yogurt, proof dough, etc then the Instant Pot LUX would work just fine for you and you save some money 🙂 For me personally, it wouldn’t work because I do need some of those features I mentioned. There are many people with the LUX who are perfectly satisfied with it. Hi Debbie – I’m glad you found the instructions helpful. I hope you enjoy your new IP Ultra! Excellent instructions! I received the Ultra 60 at xmas and continue to ‘learn’. I do have a question around the ‘Rice’ setting. I’m not able to change the cooking time setting when rice is selected. Should I be able too? Instead I’ve been selecting ‘Pressure Cook’ to cook rice. Any insight is greatly appreciated. Hi Thomas, I’m glad you found the instructions helpful. The rice setting is pre-programmed for 12 minutes at low pressure on most models. On the Ultra, it does allow you to change the pressure level from low to high but not the time (which makes no sense, since cooking rice at 12 minutes on high pressure would make it mushy unless it’s brown rice which needs 20+ minutes.) I generally stick to Pressure Cook, because I have more control 🙂 Thanks for your comment and all the best to you! THANK YOU VERY MUCH. THE ORIGINAL MANUAL DOES COMMUNICATE AS CLEARLY AS YOU DO. INSTANT POT OWES YOU. YOU SHOULD BE THEIR NEW TECHNICAL WRITER! Thanks for explaining it so that I was not afraid of blowing the kitchen up. Hi Susan – aww, thank you for the compliment 🙂 I’m glad to be of help and I hope you enjoy your new Instant Pot. Let us know what your first dish was! Gail, excellent! Thank you for your kind words. I’m always happy to help! All the best…. Performed 3 water tests on my Instant Pot Ultra 60 that I received last week. First test steam escaped constantly from steam release valve (float valve raised in normal position for pressure) for 15 minutes at which time I cancelled the test. After letting it cool and checking sealing ring and valves, tried again. This time it reached pressure in 3 minutes with steam escaping for about 2 minutes while reaching pressure wile in “on” function and steam stopped escaping when “cooking” function started. However, reaching pressure so quickly surprised me so I repeated the test the next day. This time reached pressure in 2 minutes in “on” function and then steam escaped from steam release valve during the entire “cooking” phase. Do I have a defective heating element meaning it is too hot? Defective steam release valve? Is this to be normal? I am not new to pressure cooking but never had an electric one before..
Hi, thanks so much for the info. So much clearer than the manual for sure! Just wondering how to set the altitude properly? I followed all the steps but when I enter my altitude in metres(400m) the display jumps from 0 to 600. Is this because from 0(sea level) to 600m is negligible or am I doing something wrong? Hi Shawn, your instinct is correct. You should just leave it at the default. The minimum is 2000 feet which is appx 600 meters. Thanks for your question – and all the best! What a beautiful job! Thank you for doing this. You’re so welcome, Ashira. And thank you for the kind words. Thank you for doing a great job explaining how to use the Insta Pot Ultra- of course we go big – so our first attempt is a pot roast- with your detailed instructions I am pretty sure we will have no problems. We are going to stop it 1/2 to add the potatoes,( that makes me a bit nervous- but will be very careful) I heard they tend to get mushy if they are cooked to long. I will save your instructions to read over and over again. Hi Michele – glad to be of help! Don’t worry, you’ll get the hang of it and don’t be discouraged if you have a miss or two – we all went through it. When you’re doing the potatoes part-way through, you’ll be using a quick release. This can take a while based on how much liquid is in the pot. Then when you restart, it will come to pressure much quicker than when you initially brought the meat to pressure. Feel free to ask me further questions, and thank you for commenting. Thanks so very much for this manual. Extremely helpful!! I just opened my ultra yesterday, but was pretty intimidated even before I opened it. I opened it up, and the user manual that comes with the instant pot was really not good at all. It left so many things out. I now have successfully done the water test, as well as hard boiled eggs. Thanks again so much!! Thanks for the kind words, Ann-Marie! I’m glad it all went well for you – you’re ready to cook some fun stuff now! Could you clarify the minimum amount of liquid required for the 6 qt IP Ultra 60? In the manual I read 2 cups, but I see several recipes instructing only 1 cup of liquid. I’m confused and don’t want to break it but using 2 cups left my food quite soggy. Thanks! Hi Christa, officially the minimum quantity of liquid is 1 1/2 to 2 cups. However, depending on the type of food being cooked, I have been able to get away with using less liquid. If I don’t have a dense sauce (especially tomato based or flour based, etc) I have been able to use as little as 1/2 cup. Many foods (especially vegetables) release liquid upon being pressure cooked, and that counts. If you’re up for experimenting with recipes once you’re comfortable with the Instant Pot, you can reduce the quantity of liquid. The worst that can happen is you’ll have burnt and possibly wasted food – not a great thing, but surmountable. The more you cook with the IP, the more you’ll feel comfortable changing things and even making your own recipes. That being said, all my recipes work well as written, especially for the 6 quart Instant Pot. Read my latest post for another cooking method called PIP. That is really handy for foods that you don’t want to add a lot of liquid too. You’re welcome, Christa – enjoy! Thank you so much for this detailed instruction. I just got my Instant Pot Ultra but was so terrified to use it. Thanks to this instruction, I finally mustered up the courage to use it. Deb – I love comments like yours! I hope you enjoy your new Ultra! I have had my Ultra since Christmas and I am having problems with it sealing. It only seals about half the time and I end up having to redo the process. Every time I check to make sure there is enough water and that the sealing ring is fully on, but it still never comes to pressure and sits at the preheating step. The lid is always fully on and I check the steam release button. But again, about every other time there is a lot of steam coming from the valve. When I realize that something is wrong I find I can easily open the lid. Am I doing something wrong or do you think I have a defective machine? – Have you cleaned it thoroughly – i.e. take out float valve, anti-block shield and sealing ring and clean the holes in the lid too? – Have you tried with just water, so you can eliminate ingredients as the variable? – Have you tried putting the sealing ring in the freezer? – Are you waiting long enough? i.e. do you have a lot of liquid in the pot? First, thank you for the information you’ve provided! With my new IP Ultra, my first use generated two questions that hopefully you’ll be able to answer. 1) the Saute feature I selected and set for 7 minutes. It showed preheat the entire time, but did not go to the 7 minutes and count down time. It just turned to OFF and shut down after a time period that I didn’t track, as I was expecting after preheat for the cooking time to display and count down. Does Saute feature normally switch from preheat to the cooking time and count down? 2) Cooking a pot of red lentil soup (volume about 6 c liquid in addition to lentils, onions and spices) for 30 minutes took longer than 35 minutes for natural pressure release. I expected to wait 20-30 minutes, but finally at 35 minutes it had not completed the NR, so I pushed the quick release. Does that time, longer than 35 minutes seem normal for what I described? Hi Willow – Good questions, probably will help someone else too. 2) Yes, the amount of time to release pressure naturally is directly related to the quantity of liquid in the IP, so what I do is if I don’t have the time to wait for it to go down on its own, I release the remaining pressure after about 15 minutes. Thanks for your inspiration. I bought my IP and made honey garlic chicken without knowing what I was doing. It came out great but my IP did, at one point, say BURN on the screen. It wasn’t but it made me realize that maybe I should look up instructions. Compared to IP’s manual, yours is straight forward. I have now made boiling water. Yay me! Can’t wait to make something else. Hi Kelly – thanks for commenting, and I’m so happy to help out. How do you change the time while it’s still cooking? Hi Donna – thanks for your question. You should be able to press the knob and it will display the time, press the knob again to select to change the time, turn the knob to change the time, and then finally press start again. Hope that helps. 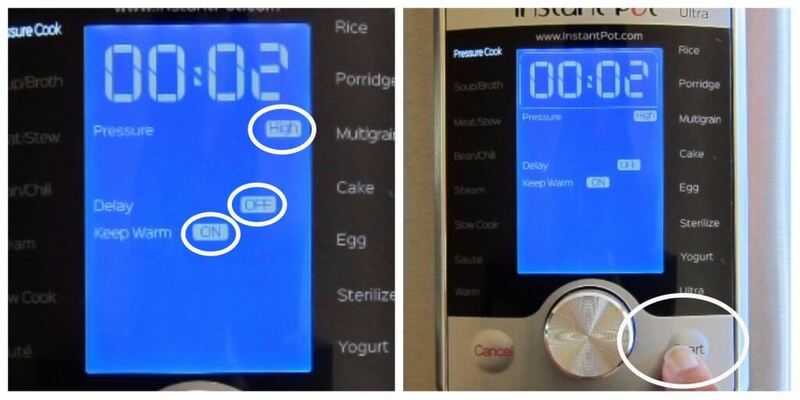 I’m loving my Instant Pot Ultra so far…….your detailed explanations are very helpful so I’m hoping you can explain why the “Cancel” button does not always seem to work? Shouldn’t it put the unit into OFF no matter what setting it is in when you press it? For instance, if I want to cancel out the warming feature when I’m ready to serve, I would think it should flash the OFF signal. It seems to function on a hit or miss basis. Hi Renee – thanks for your question. Pressing Cancel cancels the program that’s currently selected. It goes to OFF in some of the models, but on the Ultra it just cancels the current program and goes into the last program setup mode. Once it’s in that mode and idle for 30 seconds or so, it goes to OFF. Hope that helps! This was incredibly helpful to an intimidated-by-the-pot newbie like me! I was able to make a decadent lemon risotto as my first Instant Pot meal thanks to this guide. Thanks so much! I received my instant pot today and it was missing the manual, quick guide AND the recipe book… none of them were in the box or inside the pot! So I’m glad to have found your instructions and now know how to use this thing! Hi Britt – how strange that you got nothing with the Instant Pot – I wonder if it was a return? Glad you found me though! Thanks so much! This was the most helpful site I have found since getting the Ultra a week ago. I live at 5000 feet and am wondering how to use the altitude adjuster. Do I set it one time and it always adjusts? If so how do I do that? I made the hard cooked eggs and they turned into perfect soft cooked eggs. I am wondering if the altitude adjustment would have made a difference? Thank you Diane! Yes, you would set altitude once and it should remember. Press and hold the knob until you see sound, temp unit and alt displayed. Toggle to get to altitude, select ft or meters and then you can change the altitude. Thanks for all of the information and quick responses to all the follow-up questions. I recently purchased the new 8-quart Ultra. Never having an Instant Pot previously, I don’t have anything to compare it to. Reading the manual, it implies that once it completes the pressure cook cycle with Keep Warm mode Off, it should display OFF indicating Standby Mode. While my Ultra IP does that, it only displays OFF for about 30 seconds before the display goes completely dark. Is that normal? Is there a setting for keeping the display lit reflecting OFF? [It would also have been nice if it would count up indicating how long since it had completed cooking in case I miss the beep.] Thanks for any advice you can give. Hi there Joe – yeah, the display does go off, into standby mode and I don’t think there’s a way to change that. The count-up works if you have keep warm mode on. I generally leave keep warm mode on for that reason. I hope that helps – thanks for getting in touch! I recently purchased the 8qt Ultra. I have two questions. One, why is the cord permanently attached, when the instructions tell you to attached the cord, and secondly, nowhere does it address the black plastic piece attached to the bottom of the unit. I thought it was for cord storage, but it doesn’t seem to hold the cord. Hi Lon – my Instant Pot Ultra has a detachable cord – they keep changing the design back and forth! And mine doesn’t have that black hook, but my old Duo does. In older models, it could hold the end of the spoon that’s shipped with the Instant Pot, but I’m not sure about your model. Great help! I am new to Instant Pot and the instructions are lacking! Thank goodness for the above instructions. I will probably print them to have on hand. I can’t see having to turn on the computer every time I have a question! I wish Instant Pot would include the above info in the owners manual.